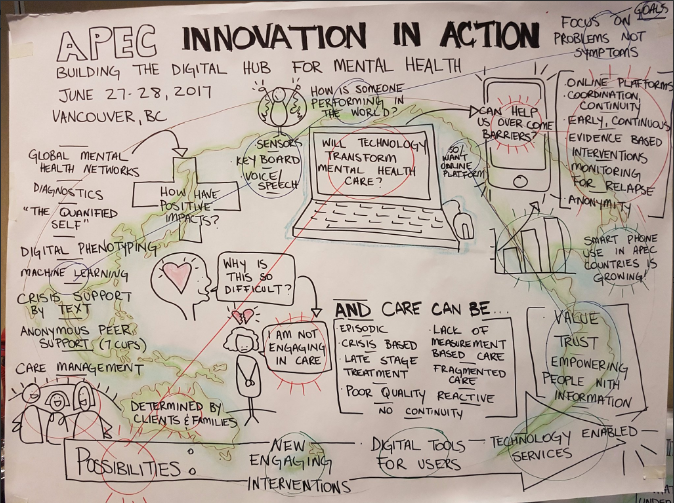 AAMH’s Co-Director, Professor Chee Ng, provided the keynote address at the APEC Innovation in Action: Building the Digital Hub for Mental Health conference in Vancouver on 27-28 June 2017. Created by more than 15 core partners from across APEC economies, The APEC Digital Hub will share best practices and promote innovative partnerships in identified priority areas to strengthen the mental health and well-being of individuals and communities in support of sustainable economic growth. Jointly sponsored by the Public Health Agency of Canada and Canadian host institutions, the APEC Innovation in Action: Building the Digital Hub for Mental Health conference brought together Hub partners, global mental health experts, industry leaders, and digital innovators to celebrate the Hub's official launch, showcase innovative collaborations in mental health, and identify new opportunities for partnership and scale-up across the Asia-Pacific. A strong statement of support for the Mental Health Digital Hub initiative was issued by the Joint Trade and Foreign Ministers at November 2016 APEC Ministerial Meeting in Lima, Peru. "We welcome APEC efforts to campaign for mental health including the development of projects under the APEC Digital Hub for Mental Health." "The recognition of the economic impact of mental health by the political and economic leadership of than a third of the world's population signifies a new phase in global mental health development. Given the enormous mental health gaps, and all too often fragmentation of precious resources, the APEC Digital hub for mental health will help address the now urgent priority of creating appropriate mental health care systems for APEC economies" - Prof Chee Ng.